Wed. #1 is HERE. Please follow us on Tumblr or Twitter, subscribe to us on YouTube or like us on Facebook. Don't miss The Wrestling Nerdcast, Nickolye's 205 Live Recap after 7 PM ET and Glove Up or Shut Up at 8! With the cheap plugs out of the way here's Wednesday's latest news. 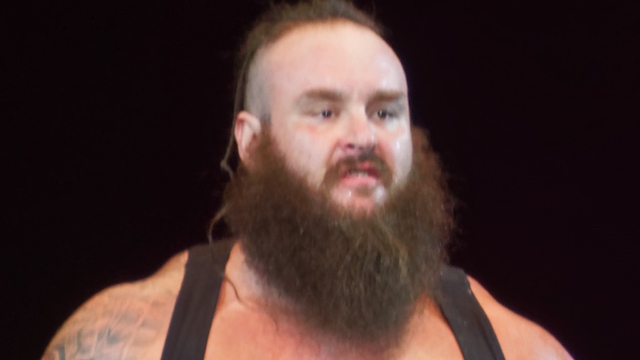 From WWE: "INJURY UPDATE: @BraunStrowman underwent successful surgery in Birmingham, Ala."
Our condolences to Edge (Adam Copeland) on the passing of his mother Judy. Here Mauro Ranallo talks about his future in MMA announcing: "Tweeting at certain times is not always smart, as they say. And I was frustrated that day by a lot of things going on internally and externally. I will say that I will continue to do MMA and I hope it will be with Bellator MMA and that we're negotiating. I was in an insecure feeling for me sort of feeling pattern. It was everything going on in the business, and it's all around us, and we see the proliferation and the growth of all the different channels that have combat sports. I guess I just wanted to send it out there for my own sake to prove to me that I can do it at the highest level and do it on a more regular basis. I'm a workaholic. I have too much free time and my free time leads me to self-sabotage. So I guess it was my way of just saying don't forget about me I still can do this believe me." Speaking of Ranallo here's an old wrestling match of his! To make a long story short Jesse Ventura says he's considering a 2020 bid for President. In this interview Chris Jerricho says there will NOT be a WrestleKingdom rematch with Tetsuya Naito: "Why does Naito get a re-match? Why? What does he do? He beat Zack Sabre Jr. You know, ZSJ is a great technical wrestler, but I can break him in two like a branch. I beat Naito. I beat EVIL. To me, you don't just get to have a re-match just because you say so. When I lost the WWE title to John Cena, I didn't just come back the next day and say, 'I want a re-match,' it doesn't work that way. I don't care what NJPW says, I don't care what the NJPW officials say, I don't care what Harold Meij says - there's not going to be a re-match! If they want to try to make the match, I'm not approving it and I'm not agreeing to it. Hey, Naito's amazing, he's one of the best wrestlers in NJPW but I already beat him, so now you have to think of other matches that Chris Jericho can have, maybe versus Suzuki or Ibushi or Okada. Tanahashi even. These are the guys I'm looking at." Here Daniel Bryan explains why he wasn't on SmackDown: "The old Daniel Bryan wrestled 227 matches in a calendar year, much more than AJ has ever done in his career. Shortly thereafter he needed neck surgery. The New Daniel Bryan is above that sort of masochism." If you give a f--k wrestlinginc.com/news/2018/11/eric-bischoff-describes-the-giant-as-mopey-before-he-left-648297 this is another Eric Bischoff recap. I think rohwrestling.com/news/10-questions-karen-q this Karen Q interview is a much better read. Here's sportbible.com/wwe/wwe-storm-ive-always-dreamt-of-having-a-match-with-becky-lynch-20181128 a new Toni Storm interview. Willie Mack's first NWA National Title defense is below. 3:00 PM ET. Tyson Kidd talks about his career ending injury: "She said, 'You have a very, very similar injury to Christopher Reeve, and the truth is your C2 is what controls your breathing. When it hit your spinal cord, you should have suffocated to death right there. She said five percent of people survive this injury and of the five who do, 99% are paralyzed. (After surgery) I just would try to fill up my time literally playing video games. I have this room upstairs and I would literally be playing video games all night. I wasn't drinking like a mad man, but I'd be drinking a bunch of beers up there while I was playing and the next thing I knew it was like 7 a.m. and I'm coming out of that room and the sun's coming up. It was this horrible cycle. And obviously there are people with much worse stories than that. But for me, that was as bad as it got. Physically that was probably as bad as it got. Even then, a year later, I was having a hard time getting my body back. (It was almost like I was) coasting through life or like I'd lost or had misplaced my purpose in life. I mean I was getting paid every week. That was cool, but I was not on the road. I was used to a very specific lifestyle. Before I got hurt, I was on the road five days a week and then I'd come home for a day and a half. And some of those times, I'd be filming Total Divas, so at some point I was working seven days a week, which I was cool. I loved it. And then you go from that to zero. It's a hell of a shell shock. It took a long time to kind of come to grips with it. It took a long time to get out of that and be like 'Okay, I've gotta do something,' but I guess, especially initially, I didn't know what it was. To all of a sudden go from feeling almost invincible to being temporarily paralyzed to then having rods and screws in my neck and not really being able to move around to seeing my body change, I definitely, definitely, definitely did not feel myself at all. I remember filming Total Divas and we went on this vacation with Mandy Rose's family. It was August/September and it was hot out and I didn't want to take my shirt off in the Florida sun. I was so self-conscious. I was like, 'This is not me.' I felt like I'd inherited somebody's almost broken-down body." Here Edge talks about Roman Reigns: "I had to retire due to injury, but in this case, we're talking life or death. This is leukemia, a thing you don't expect to hear from a guy who is in the prime of his career and looks like a superhero. The first thing I felt when I heard the news was sad, but I don't think Roman wants people to feel that way. I feel for him, but the best thing he can do is surround himself with his family, and that's what he's doing. As long as he gets healthy, who cares if he ever wrestles again? I watched him on Raw and thought that moment had to be really, really difficult, but he handled it with poise and class."